- We must agree to abide by the CFP Board's Code of Ethics which requires certificants to practice financial planning with fairness and integrity, and to be held to the fiduciary standard of always putting the client's interests first. - The CFP® designation is attained through a rigorous course of graduate-level study and a 10-hour exam testing all areas of the financial planning process. Going forward, certificants are required to complete 30 hours of continuing education every 2 years. - CFP® practitioners agree to abide by a strict code of professional conduct, known as CFP Board’s Code of Ethics and Professional Responsibility, that sets forth their ethical responsibilities to the public, clients and employers. Learn more here; WHAT IS THE CERTIFIED FINANCIAL PLANNER CERTIFICATION? A plan can cover all major areas of a household's money matters, starting by addressing the most essential needs first then working up to more advanced wealth and goal planning. 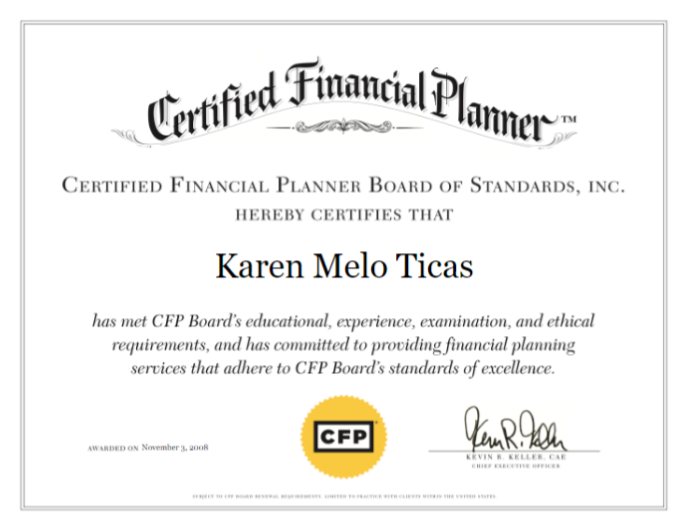 Click below to learn more about my credentials or the Certified Financial Planner Board of Standards, Inc.
*Implementation of financial planning recommendations can be done with the company of the client's choosing and may result in fees and/or commissions separate from financial planning fees. Any discussion of taxes is for general informational purposes only, does not purport to be complete or cover every situation, and should not be construed as formal legal, tax or accounting advise. Clients should contact their qualified legal, tax and accounting professionals as appropriate.